On Saturday, September 28, 2013 members of Families and Friends of Louisiana’s Incarcerated Children (FFLIC) and local child advocates Safe Streets Strong Communities (SSSC) and Community Education Project of New Orleans held a Parent Leadership Training for parents of children who are being suspended for minor infractions and/or are in prison. We are calling on our local school districts (RSD Direct Run, RSD Charters, OPSB, and OPSB Charters) and government officials to end out-of-school suspensions for minor offenses and focus on implementing positive discipline policies that keep our young people in school and on a path to graduation instead of being criminalized and pushed into the streets, low-paying jobs, and prison. We know that there are positive alternatives to suspension that work, and we need to invest more in teacher training, counselors and restorative justice practices. The event organized by FFLIC and local advocates took place in the context of the Dignity in Schools Campaign’s 4th Annual National Week of Action on School Pushout. 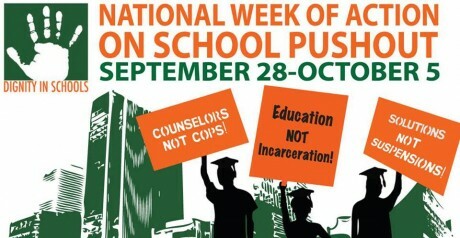 During the week of September 28 – October 5, events are being held in over 42 cities across 24 states to demand the implementation of positive approaches to school discipline like restorative justice practices and positive behavior supports, and to call for a nationwide moratorium on out-of-school suspensions. School zero tolerance policies were originally intended to apply to the most serious cases such as assaults and possession of drugs and weapons. However, according to the Juvenile Justice Project of Louisiana’s (JJPL) Suspensions Matter “in reality, 95% of out-of-school suspensions are for non-violent, minor disruptions such as tardiness, disrespect, or broadly defined “willful disobedience.” Due to zero tolerance policies, Louisiana’s average for out-of-school suspensions is 30% higher than the national average”. Out-of school suspension rates still remain extremely high in RSD direct-run schools at over twice the rate of out-of-school suspensions statewide in Louisiana. Over the 2010 – 2012 school years, students in RSD direct-run schools have missed 18,677 school days as a result of out-of-school suspension. In 2011-2012, there were 393 out-of-school suspensions that were one to two weeks long. The above reasons are why we need a moratorium on out of school suspensions for minor offenses and to push for the use of positive and effective alternatives outlined in the Model Code on Education and Dignity says our families and youth. FFLIC will host a social media event to launch the Dignity in Schools Campaign (DSC) – Louisiana Chapter to build capacity and develop a joint campaign to Push Back Against School Push – Out! Organizations interested in joining should contact Gina Womack at gbwomack@fflic.org or 504.522.5437 soon as we have a limited number of slots. EVERYONE CAN GET INVOLVED: Organizations and individuals out of state can also get involved: Please make sure to click this link and complete the action alert today, calling for our priorities in the Federal Education bill (ESEA).